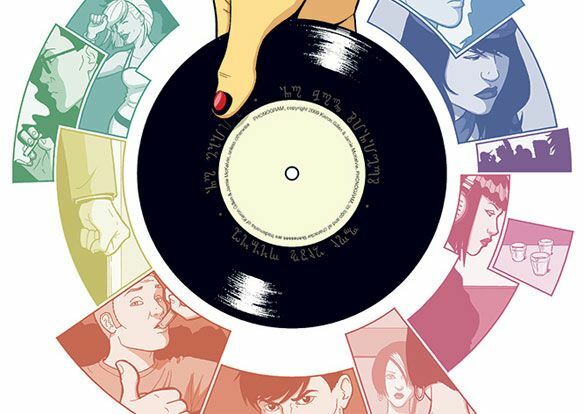 With Phonogram: The Immaterial Girl due for imminent release, Getintothis’ Martin Summerfield takes us on a nostalgic journey back to the heady days of 90s Britpop – through the medium of a graphic novel. 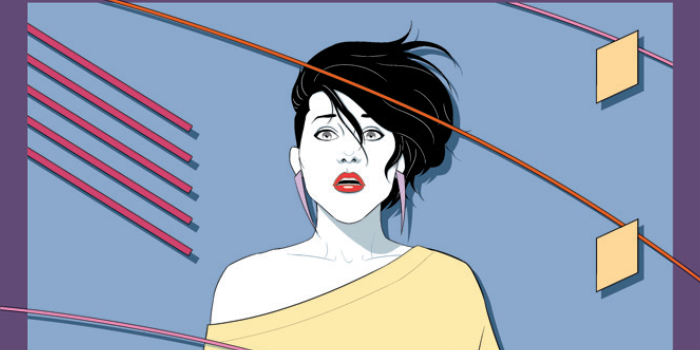 So, with Phonogram: The Immaterial Girl finally coming out on August 12 we thought we’d do a retrospective on the series and tell you what to expect. 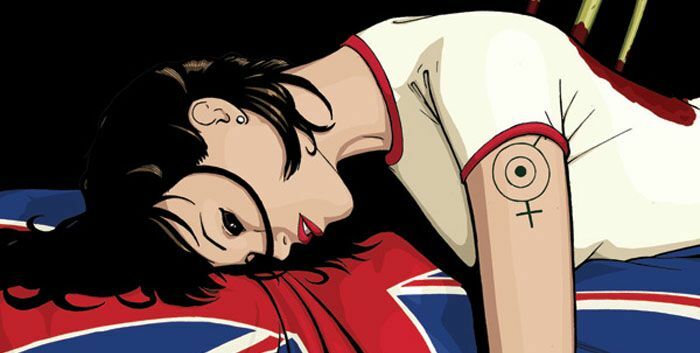 Firstly, you might ask why we’re covering a graphic novel on a music blog, but Phonogram is a love letter to the Britpop and indie music scene of the 90s through to the now while also being a musical religious pilgrimage. The first volume, Rue Britannia focuses on protagonist David Kohl, a phonomancer – a kind of musical shaman who manipulates the energy and mood of music to manipulate others. The first volume is entirely in black and white, capturing the feeling of an indie comic whilst also encapsulating the feeling that you’re looking into the past, into the grime and the glory of the 90s. Kohl is cursed by a goddess to find Britannia – there’s only one problem, she’s been dead for a decade. Kohl’s curse is a gradual erasure of his own identity as he begins to like bands he has a notable disdain for throughout the book – he starts singing Great Things by Echobelly, and at one point actually thinks he likes Cast. Trying to take Emily Aster’s advice, Kohl tries to forge a new identity with another music scene to free himself of the curse while there’s still enough of his own soul to salvage, but wrestles with abandoning who he is. What follows is a musical vision quest in which Kohl has to journey to a Memory Kingdom, to prevent retromancers (phonomancers who try to resurrect dead music scenes) from resurrecting Britannnia and save his soul while being led through a Dante-esque landscape guided by Luke Haines of The Auteurs. There’s a particularly poignant subplot that runs through the whole story of the ghost memory of Beth, an ex Manic Street Preachers fan who just can’t let go of Richey Edwards, while the actual Beth is alive and well but has nothing but apathy for the music scene and has settled down. The whole book is about how music defines our identity, how our tastes shape us and affect those around us for better or worse; how for the passionate music is a way of life, and that without that obsession and fanaticism we’re just shadows in the pantomime of our lives. The second volume, The Singles Club is a series of vignettes about a seven characters attending the same club night whose stories intersect at various points like a dance Venn diagram. Singles Club is in glorious technicolour, and the scope of graphic novel also seems a lot larger and more ambitious. Kohl isn’t the focus of Singles Club, but he’s there at various points, like Morpheus in the best Sandman stories, a small presence and a deft touch with just a step over the line of the Prime Directive in terms of interference in the story. Again, just like Rue Britannia, Singles Club has an extensive glossary of bands and artists mentioned within, acting as a who’s who of bands then and now, something we hope will carry over to Immaterial Girl. Penny is obsessed with dancing and a boy named Marc and dancing with Marc, who is too busy reliving a night with the ghost memory of a girl he once loved. Laura, Penny’s long-suffering friend is brought along as her “plus one” but resents the feeling that all she’ll ever be is somebody else’s plus one. Laura is, like Emily Aster was, a cutter who constantly inserts Long Blondes lyrics into her speech, who feels constantly caught in the ebb and tide of other people’s lives, caught between acting and being acted upon. Lloyd has an obsession with Dexy’s Midnight Runners and is obsessed with a plan to utilise soon to be out of copyright pop hits and retool them and subvert them into some kind of post spank rock band, but nobody wants to listen to his blueprint for success. Emily Aster is dragged along by Kohl to the night, only to be haunted by the girl behind the mirror who she traded places with when she sold her soul. Her origin was hinted at in one panel in Rue Britannia in which she tells Kohl that the only way to reverse his curse is to redefine his identity like she did, but here you actually see Claire, the woman in the mirror. A hint of things to come in Immaterial Girl, which Gillon and McKelvie have confirmed will focus on the warring personalities of Emily vs Claire. The compass point on which all of these stories revolve is the Jay and Silent Bob-like comedy duo of DJ’s Seth Bingo and Silent Girl, who are constantly snarky with the cast of characters and each other, Silent Girl playing Pull Shapes by The Pipettes against his will after he shuts down Penny after requesting it. Seth also seems to have known Emily Aster when she was Claire, as he refers to her liking Garbage’s classic album Version 2.0, a vicious jibe to her past self, a prisoner behind a looking glass. When the night looks like it’s died before it’s even begun, they put on safety glasses and tuber gloves and take out a phosphorous glowing vinyl, which is of course Atomic by Blondie. Each story has a b-side, a short story that doesn’t have any bearing on the main plot but enriches the world around it. What we really loved was Kid With A Knife’s retelling of Rue Britannia in comedic style, making Kohl come across as the pretentious wanker he can sometimes be, while Kohl mutters into his drink “that’s not the way it happened”. Another thread running through the b-sides is Indie Dave’s attempts to escape his hermetic existence, which is a limited success (well, he manages to get out of the house and he is trying), but then is quickly torpedoed when Emily Aster sends him a CD with The Killer’s cover of Shadowplay after he’s seen Control. The volume ends with Kid With a Knife, Kohl’s foil and fool from Rue Britania, who has an experiment with phonomancy which involves breaking up a fight, getting a kebab, having “a dance and drink, and screw” all the while his eyes lit up like a wolf’s, his every speech bubble depicted in symbols and pictures rather than words, but you can easily tell what he’s saying. Kid is the only character who’s not a phonomancer, so there’s a vicarious thrill when the character who’s always played as the fool, the Chaz to Kohl’s John Constantine, takes a joyride through the world of phonomancy, and learns nothing but has a great night, which is the whole point – Kid isn’t Kohl, he’s a creature of pure id who’s out to have a good time and he does. Sometimes, that’s all there is and that’s all there needs to be. Next Article Cosmic Slop #28: Did you know/care that the Black Eyed Peas had reunited?